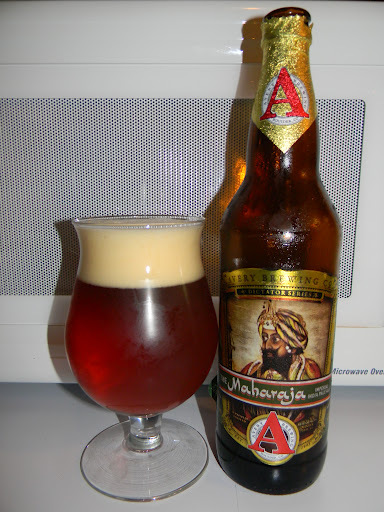 Review of Avery Maharaja | Beer Apprentice - Craft Beer News, Reviews, Interviews and Info. Hello everyone. I hope you all are doing well. For today’s craft beer review I’m going to be trying the Avery Maharaja produced by the Avery Brewing Company situated in Boulder, Colorado. This brew is highly thought of in the craft beer world and is widely considered by most to be one of the best Imperial IPA’s on the market. I, personally, have never tried it, so I’m really looking forward to tasting this beer. From the website, averybrewing.com, we find this description. This beer comes in a 22 oz. bomber and has an ABV of 10.39%. It poured a relatively clear, deep copper to ruby color with some shimmers of orange around the edges when held toward the light. The collar was greatly sized, off white, smooth, kind of creamy and soft. The retention time was super and the lacing was very adhesive and looked really nice. A beautiful looking beer right here. The nose brought out hints of pineapple and grapefruit. The pineapple seemed to stand out a bit more I thought. Cotton candy and a light, sugary caramel malt took care of the sweetness while bits of pine and undertones of bread revealed a nice, little earthy and herbal distinction. Overall, very well balanced and harmonized. It wasn’t quite as pungent as some of the other Imperial IPA’s I’ve experienced though. Oh well, it still smelled quite good. The taste presented more of that sweet candied sugar from the caramel malt. It actually kind of had a “syrupy” flavor. Citrus of grapefruit, pineapple and other assorted fruits. Maybe apricot? The piny components were found again, which continued to contribute to hoppy essence as well as the bitterness. The breadiness was very relaxed in the taste, but it still had a decent earthy tinge. A modest amount of alcohol was exposed as the brew began to warm. As a whole, it was quite rich and robust, however a tad more malty than what I thought it might be. The mouthfeel was medium to full bodied. Smooth, dry, chewy, sticky, oily and slick. The carbonation was fine and a deep warmth was felt from the alcohol. Finally, a suitable amount of flavor was left behind on the palate long after the sip. Well. There’s no mistaking that this is a very, very nice beer. It’s all together “big”, although the drinkability was still rather good. I can definitely see why so many people rave about this brew, but for me it was just a fragment malty. I did enjoy it very much, however I, personally, don’t think it’s as good as some of the other Imperial IPA’s I’ve tried in the past. I would never turn it down that’s for sure and I will more than likely pick it up again sometime in the future. If you guys happen to be able to get the Avery Maharaja in your area I would suggest that you pick up a bottle, give it a try and see how you like it. It very well may be the beer you’ve been searching for.